leeds racing driver Sam Tordoff is returning to the British Touring Car Championship two years after being beaten to the title on the last race of the season. After a year in the British GT Championship, he will be driving with Motorbase Performance in 2018, looking to go one better than his 2016 second-place finish. 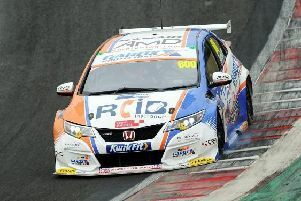 “I definitely have unfinished business in the BTCC,” Tordoff said. “There’s one thing I need to come back for and that’s the drivers’ title. “Having missed out on it by such a close margin, I wanted to come back in a situation that was enjoyable for me and in an environment where I fit in with the team, and I’ve found the perfect solution with Motorbase. “When I left in 2016, I needed to clear my head and try something new: I wanted to drive a GT3 car and to race around Europe. Having done that for a year I’ve reset and I’m ready to do battle again. Tordoff, grandson of car dealership JCT600 founder Jack Tordoff, will race in a Team GardX Racing Ford Focus RS, and a nod to his family heritage with car number 600. Despite his narrow miss in 2016, Tordoff has been part of three BTCC title wins, helping MG to a constructors’ title in 2014 and West Surrey Racing to manufacturers’ and teams’ titles in 2016. Motorbase performance team principal, David Bartrum, is confident that Tordoff can continue that success in 2018. “Sam is a great addition to the team,” he said. “He’s a quality driver, with a proven track record of winning races. “He’s a multiple race winner and did a great job in his four previous seasons racing in the BTCC, as well as in British GT last year.